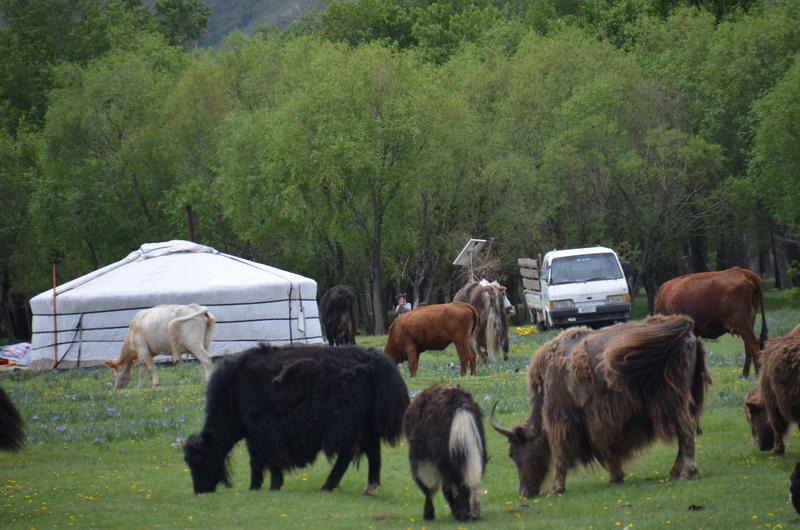 Driving down the road, we saw a ger with a herd of yaks grazing beside it, another with 30 camels resting nearby and a third with yaks, horses, goats and sheep. 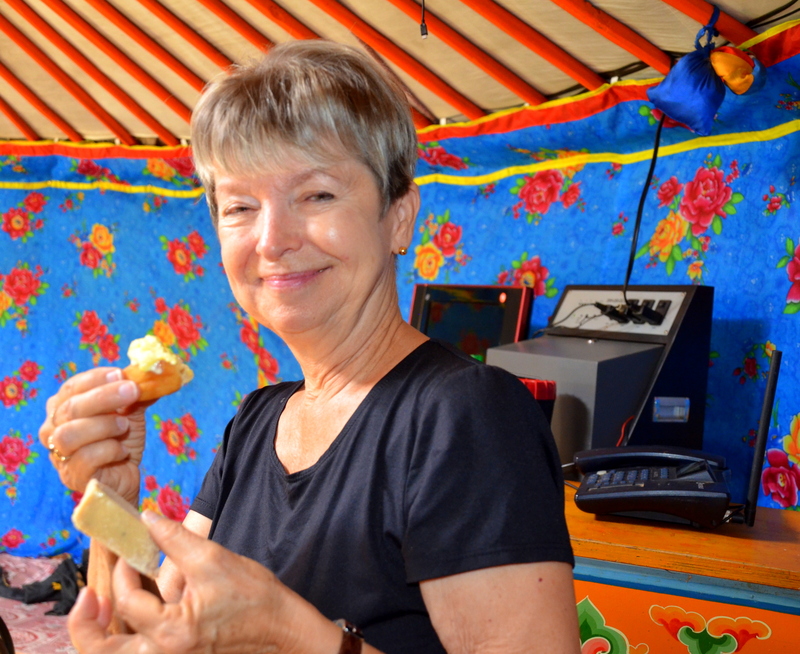 When asked if we could visit, “Come on in,” was the answer from each nomad. 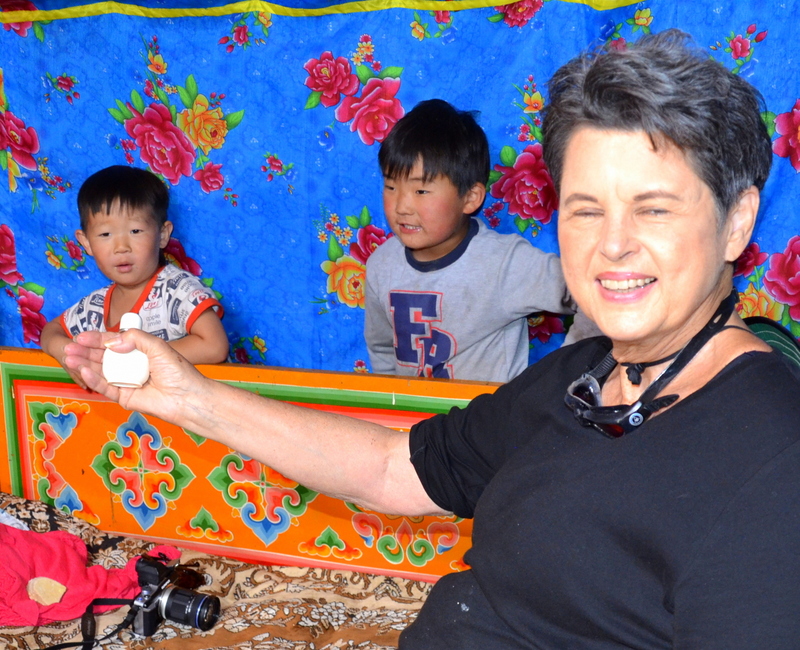 And, what a truly special education and a one-of-a kind experience we received from our new friends in the Gobi Desert of Mongolia. 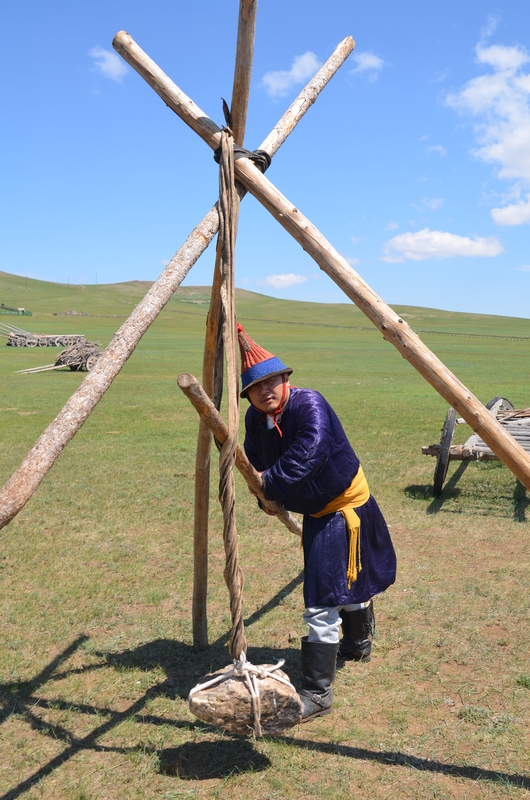 Entering each yurt, called a “ger” in Mongolia, we were escorted to the left side of the round structure where guests are seated in the most honored location, on the bed farthest from the door. 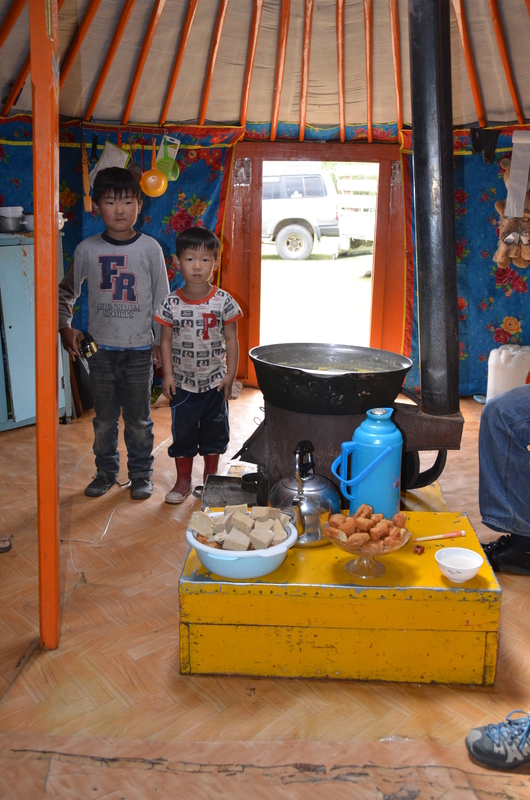 The nomad family sat on the rightmost bed farthest from the door near the kitchen. 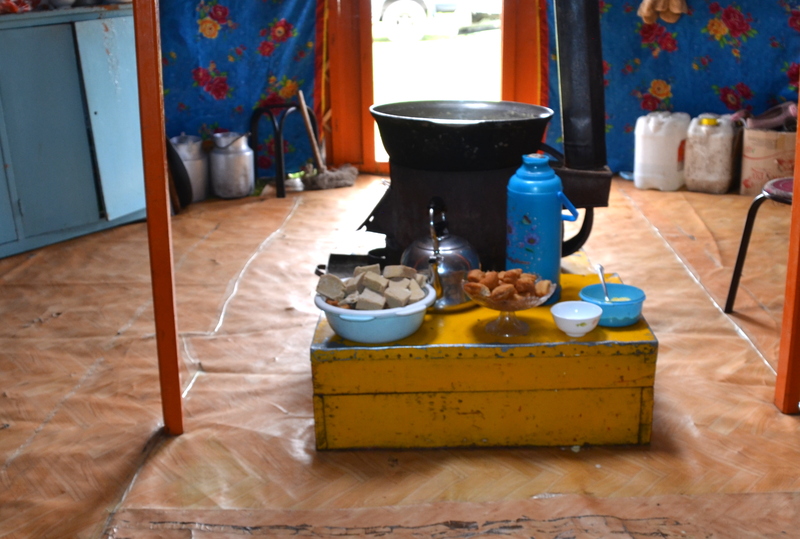 Between the two groups were a religious display, a cow-patty-fueled stove, and a small table. 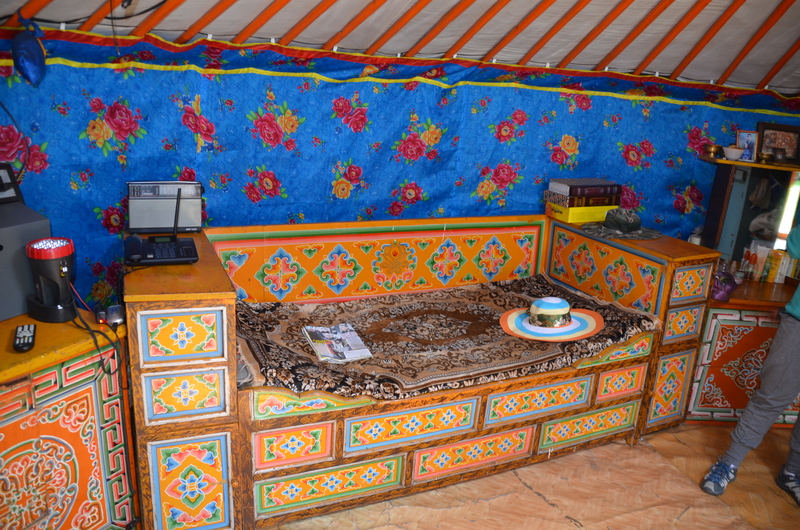 All basic, sturdy furniture was painted bright orange, signifying long life, power and positivity, with multi-colored colors of green, blue, yellow, white and red used in the traditional Mongolian designs and patterns. 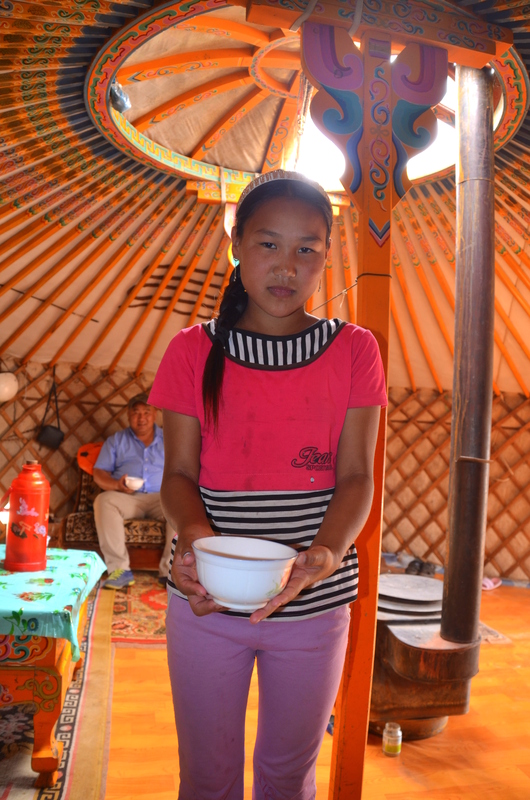 The traditional drink of Mongolia, tea served in a bowl, was offered immediately. 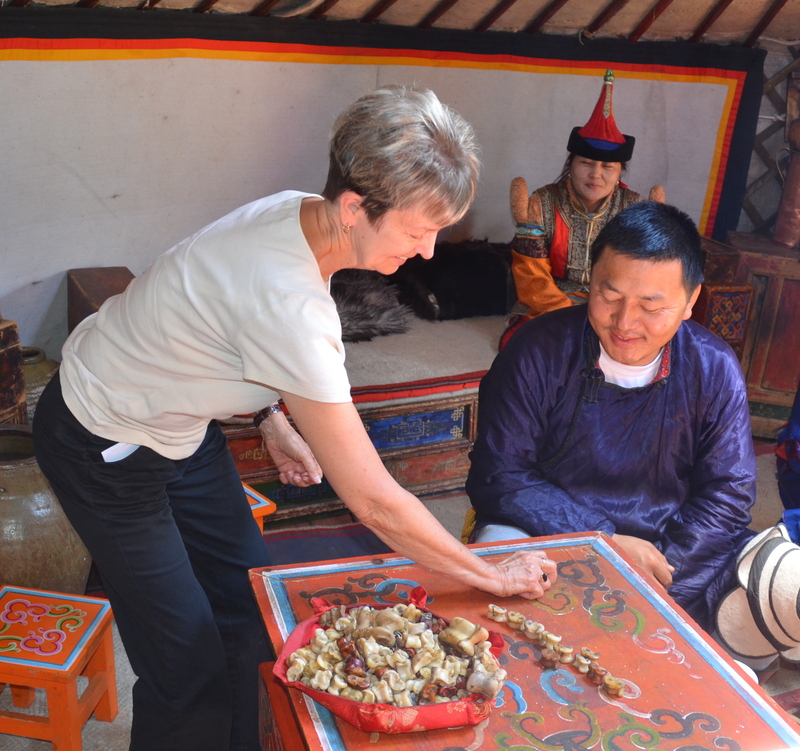 Served with two hands showing respect, each family offered us the delicious tea concoction poured from a thermos jug. 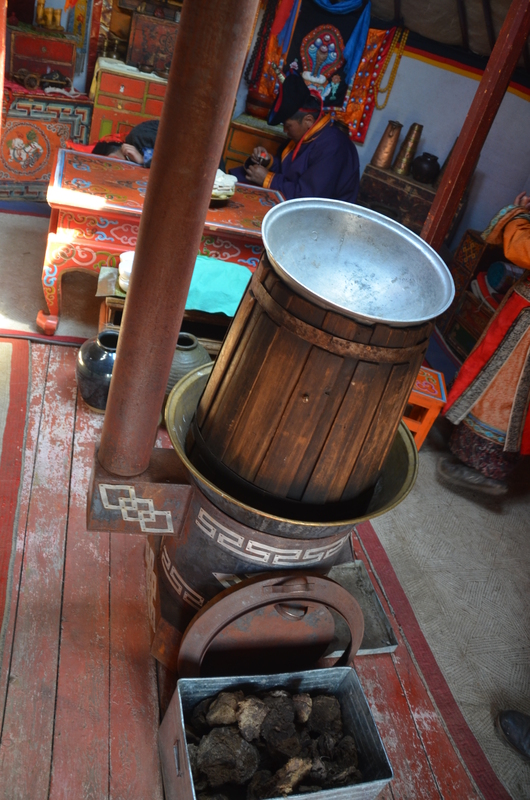 The tea was made of milk from a cow, yak or camel, with salt and tea added, then cooked to boiling in a large metal cauldron on that stove in the middle of the ger. The head of the household officially greeted each one of us by passing his prized snuff bottle to us using the right hand with the left hand supporting that arm at the elbow. We took the snuff bottle, unscrewed the lid and either smelled the snuff or put some in each nostril. Each family had a bottle made of jade. Afterwards, each one returned the bottle to the household head, which then passed it to another guest. 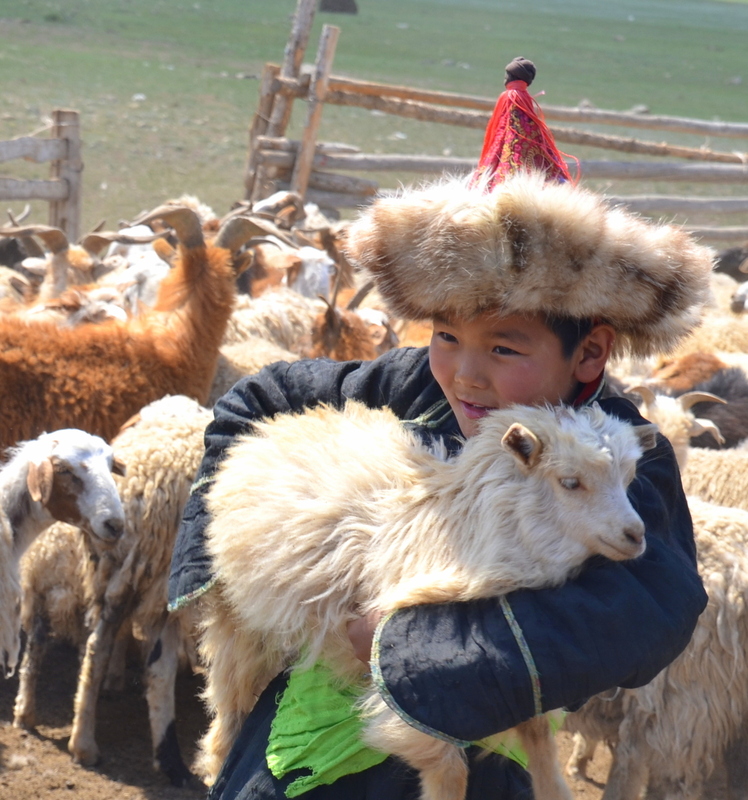 Now, we had been officially greeted and welcomed by each nomadic family. This prized bottle was placed on the religious display for safekeeping. The heavy snuff bottle indicated a nomadic family’s wealth or standing. The cap and bottle could be made of coral, jade, gold, silver, or a semi-precious stone. Any other materials indicated lesser importance and wealth. Offerings of the 30 various products made from milk followed, including yogurt, butter and bread that tasted like a donut. And all were really good and allow the nomad to live independently as possible in the desert. Finally, it was time to officially meet the family. 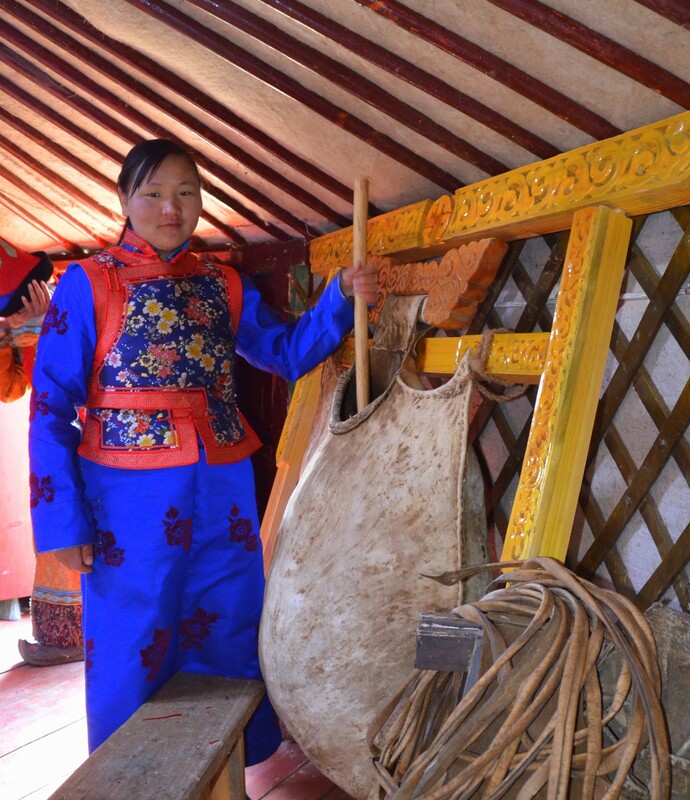 At the first ger, the family of four included the two children, four-year-old Somomjamts and six-year-old Bumbuuleai, who enjoyed running, playing and posing for guests’ photos. Their mother was 36-years old. 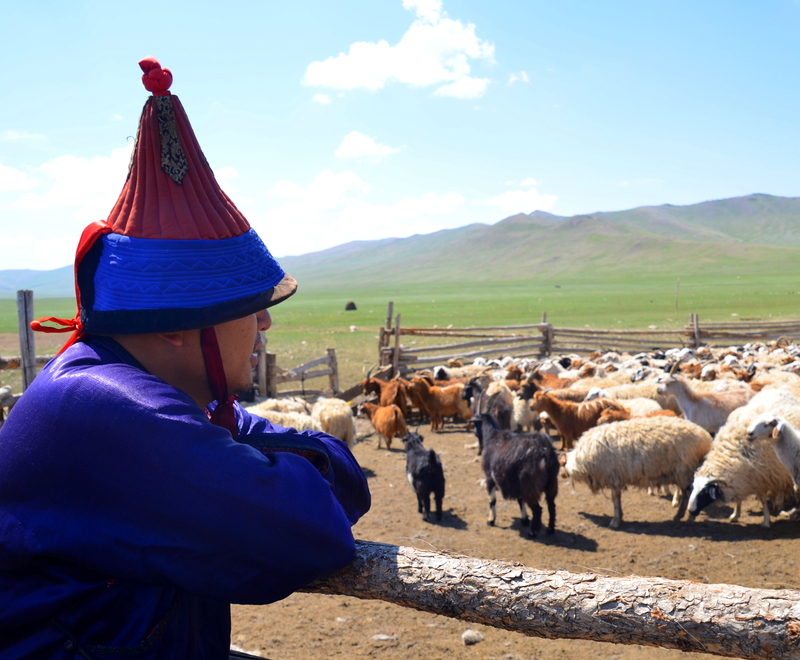 Their father, 34-years old, was spending the summer in the high mountains tending their animals in the high grass. 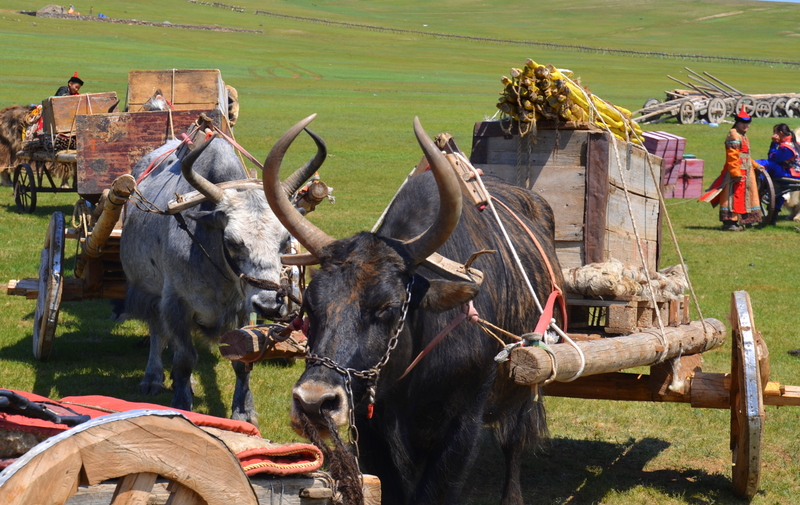 Every three weeks, he would return to the ger to stock up on more supplies before returning to the high grass. 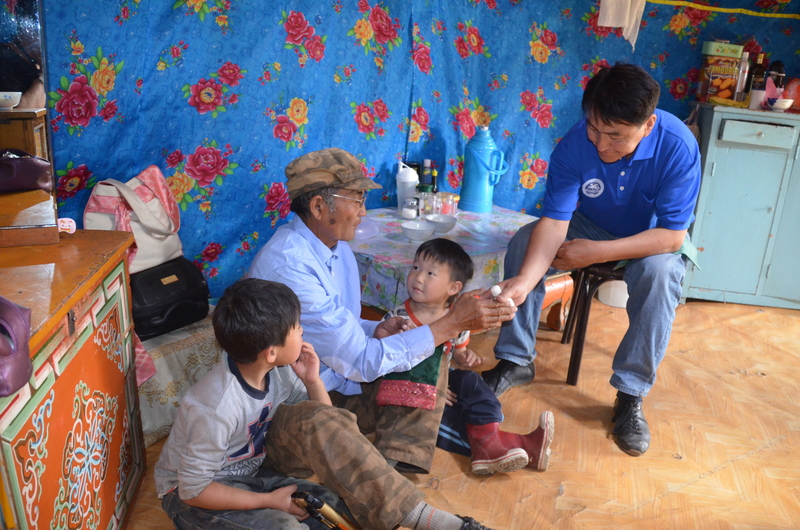 The mother’s father, 66-year-old Tsunga, came to meet us also. 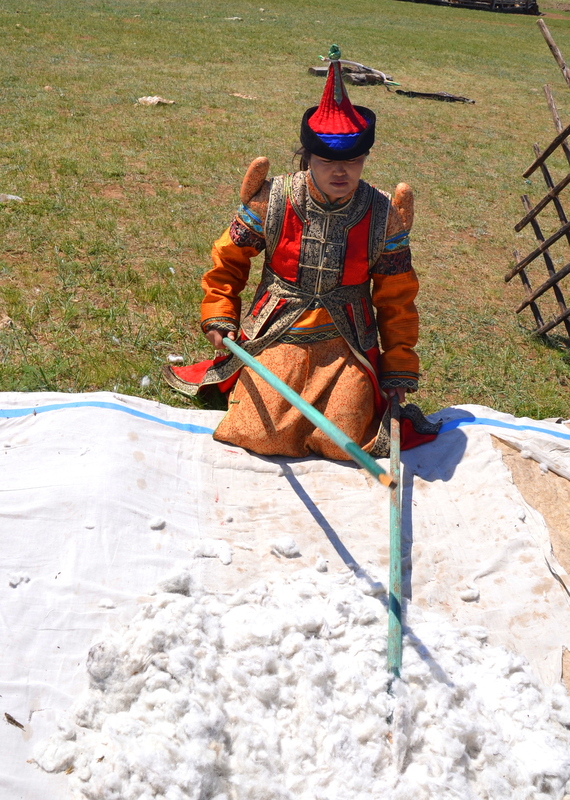 Tsunga said it takes 1-2 hours to build their felt ger. They are planning to build an adjacent ger for storage. During our visit, the phone rang and the mother answered it, talked, finished, and placed it back between the rafter and the thick felt ger roof covering. It seems the phone only worked in that area so she could not move it. 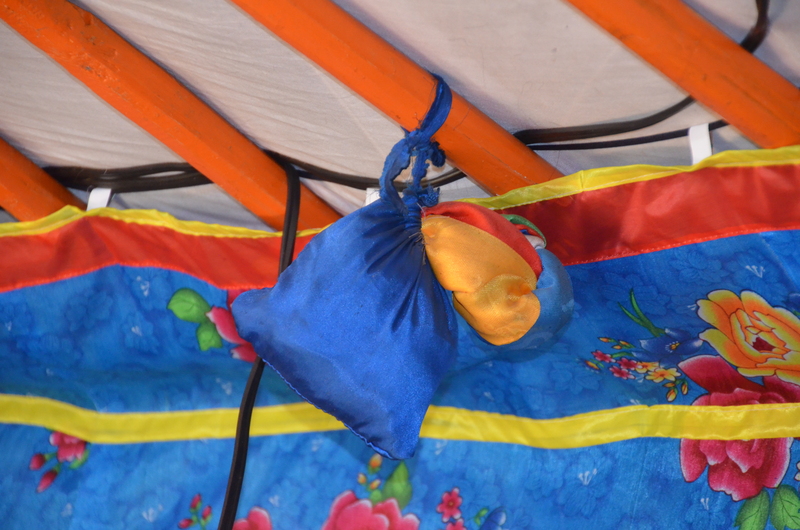 A blue satin bag with blue ties full of multi-colored ribbons hung from another rafter. 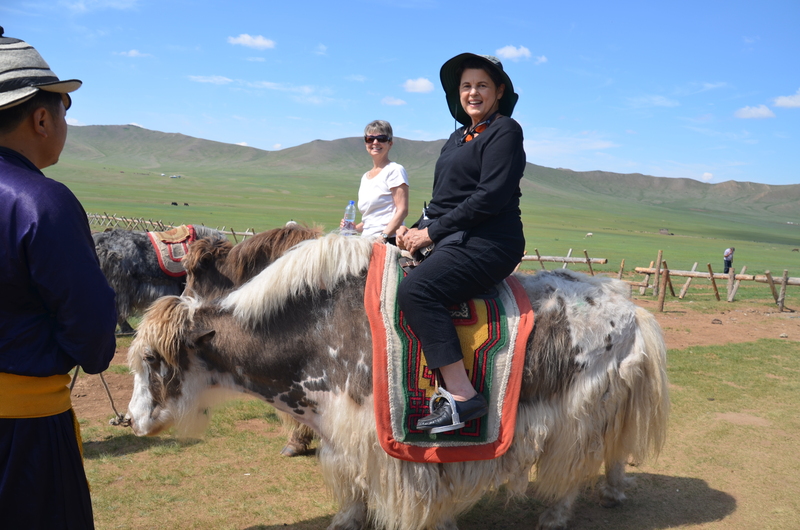 This is the Mongolian good luck charm, with the colored ribbons representing the blue sky, the green grass, the white milk, the red in fire, the yellow of the sun and the gold of good fortune. Driving to our next ger, we saw several six-foot-tall piles of stones with blue strips of fabric attached to a pole protruding from the top of the pile. 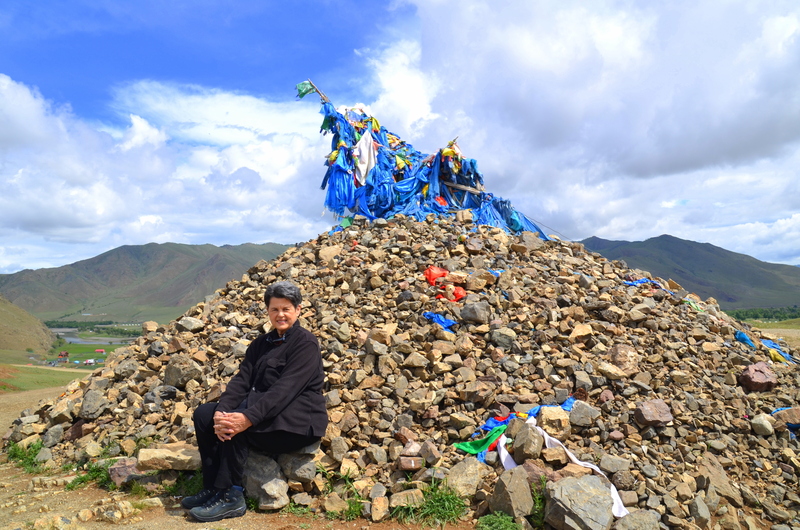 These are “ovoos” (pronounced oh wahs) used in worship of mountains and sky in Buddhist ceremonies. To wish a safe journey, a person walked around the pile of rocks three times clockwise and placed more stones on the pile. These monuments also serve as landmarks. 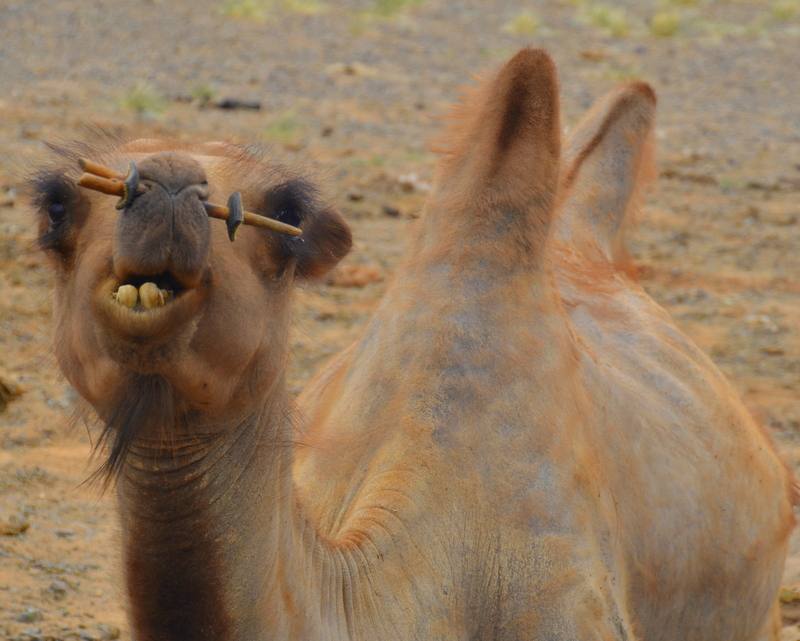 At the second ger, 30 Bactrian camels were resting on the ground just waiting for us to visit. The babies were especially cute and were naturally losing their winter long thick hair while the adults had just been sheered and their hair sold at market. 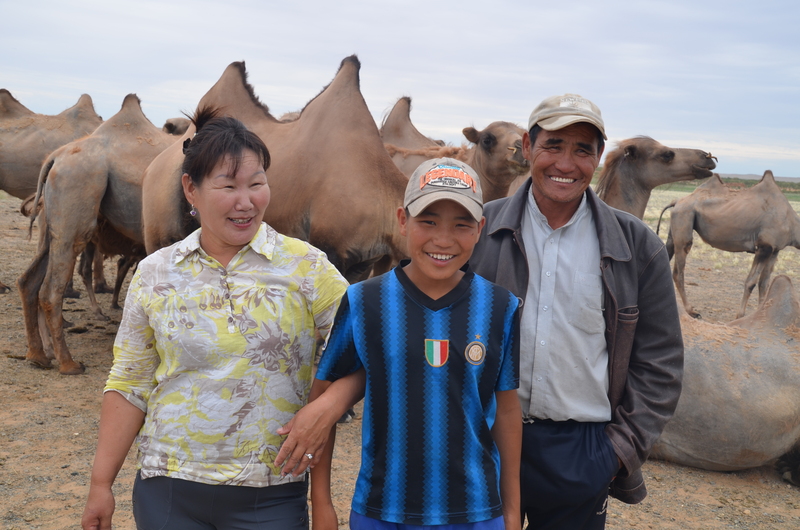 As we were visiting the camels, the nomad family’s beautiful young daughter greeted us and invited us into their ger for the official greeting with her parents and brother. “Could we ride a camel?” we asked and the next thing we knew we were on a camel’s back for a unique up-down ride and dismount. We were laughing and howling it was so much fun! 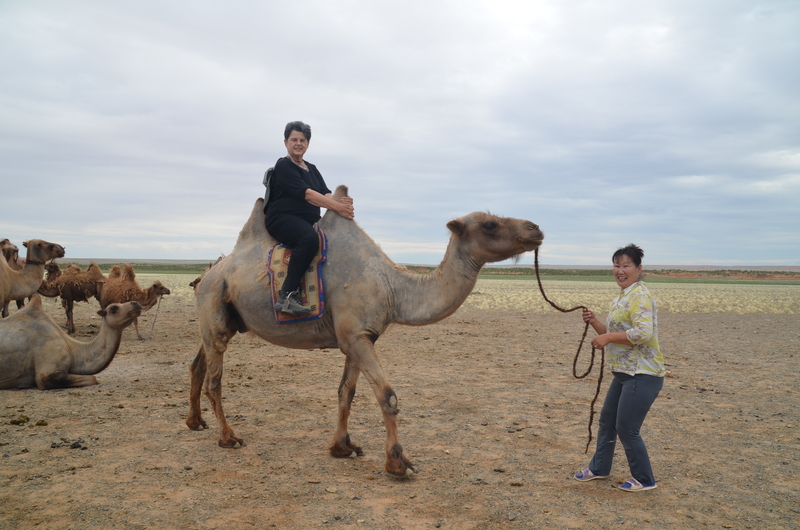 Sitting between the two humps was ideal as it kept us from sliding forward or backward. 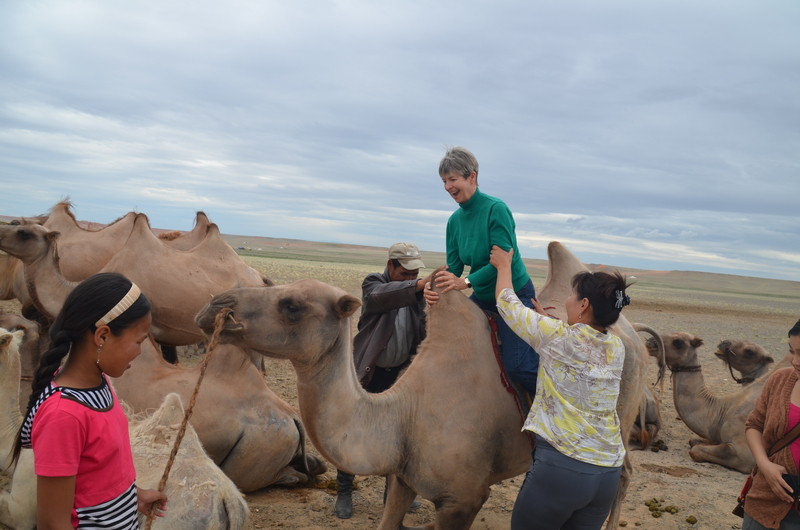 After the camel ride, it was time for the official of the official nomad greeting when they offered us vodka they called nermel, which they make after fermented camel’s milk (called Khoomag) and yogurt. 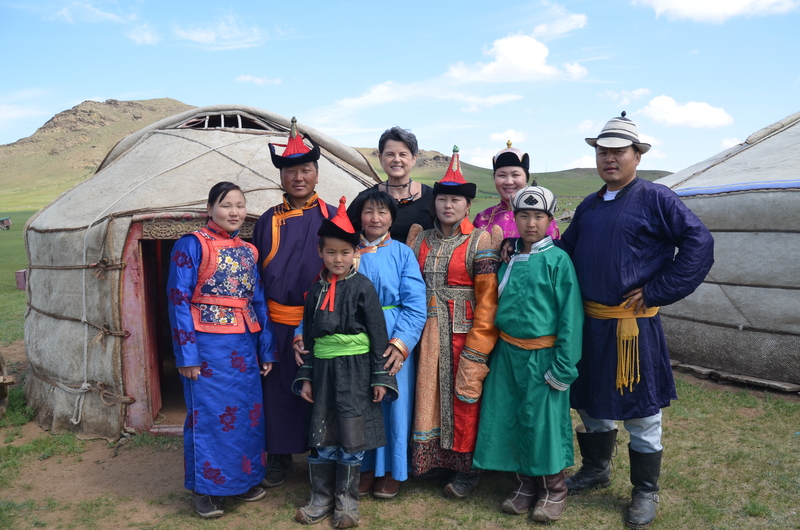 At the ger, more nomads in their traditional native dress greeted us and showed us several of their nomadic traditions. and softening strips of leather by attaching them to a heavy rock and rubbing them up and down many times. Our final exhibit was how the nomads make yogurt from milk. Mare or camel’s milk is put in an enclosed cow skin sack. 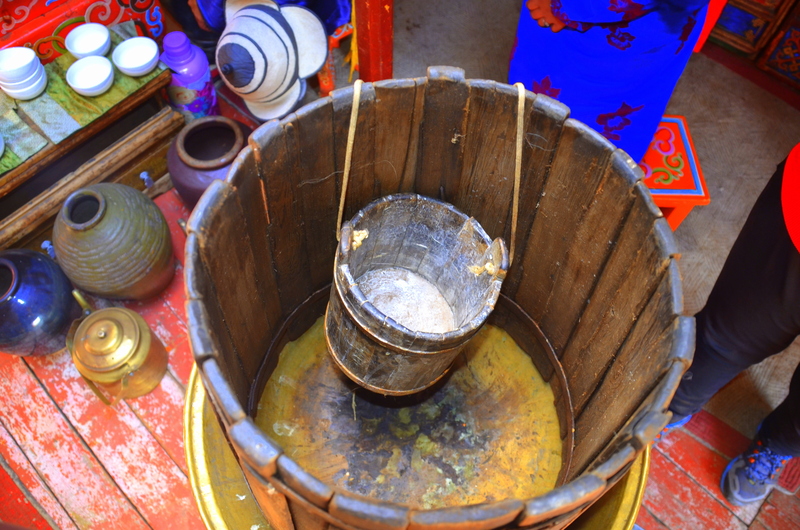 And with a paddle, the milk is stirred 5-10,000 times for 3 days and fermenting occurs during the process, resulting in fermented mare’s milk (airag) or fermented camel’s milk (khoormog), another nomad-prized drink. 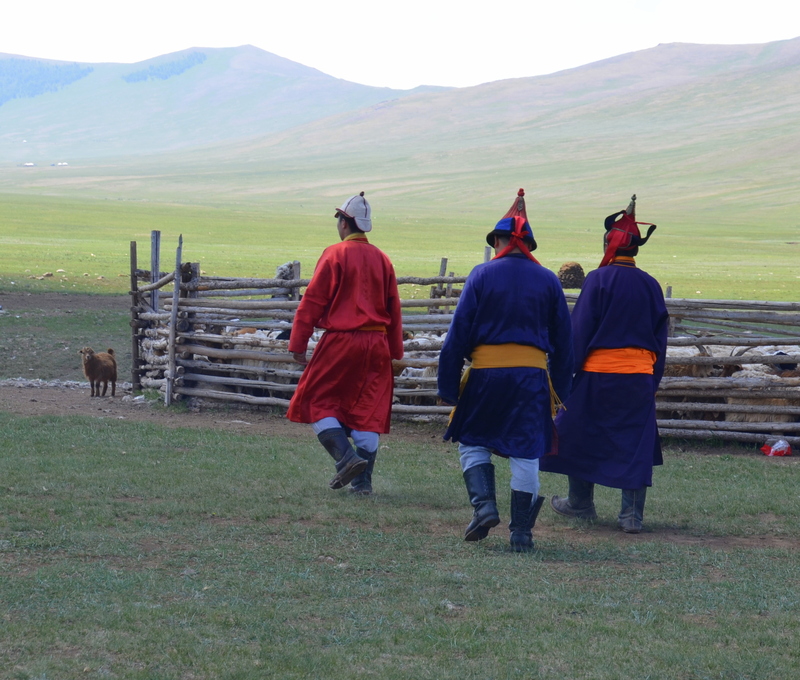 plus a game of shagai, better known as the “sheep-ankle-bones” game. With these bones, we played games of horseracing and fortune telling. 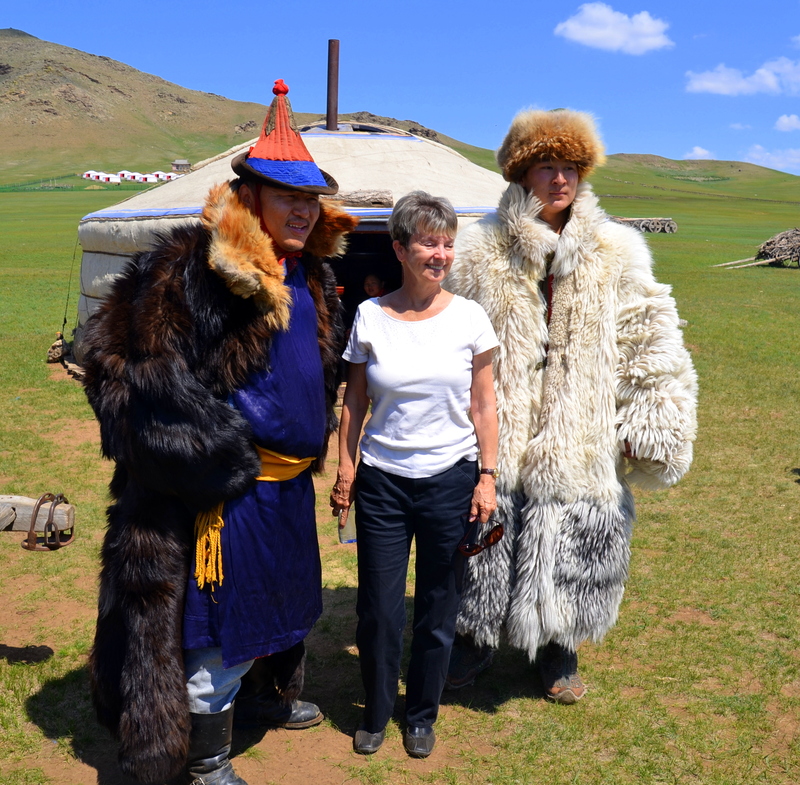 But the official of the official greeting came when the nomads offered us vodka, they called nermel, which they made after fermented camel’s milk. 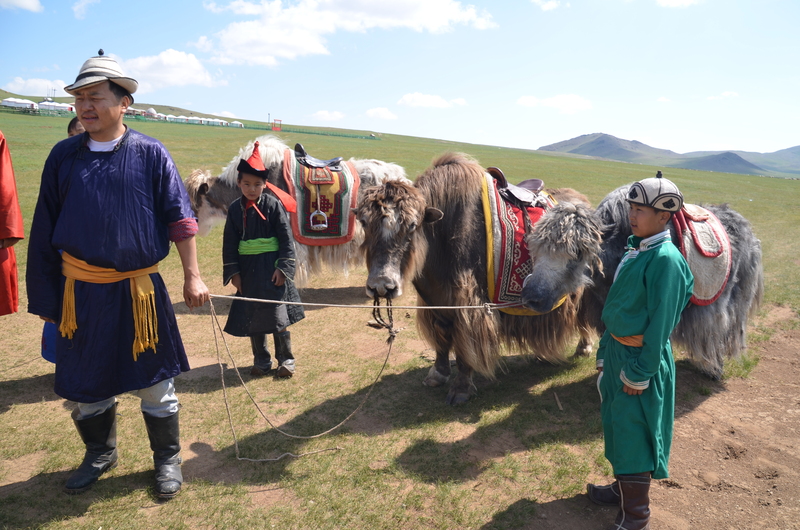 After letting us examine their heavy sheep skin winter coats, they demonstrated how the yaks and carts are loaded with all their possessions as they move their entire ger settlement to a better grazing area. 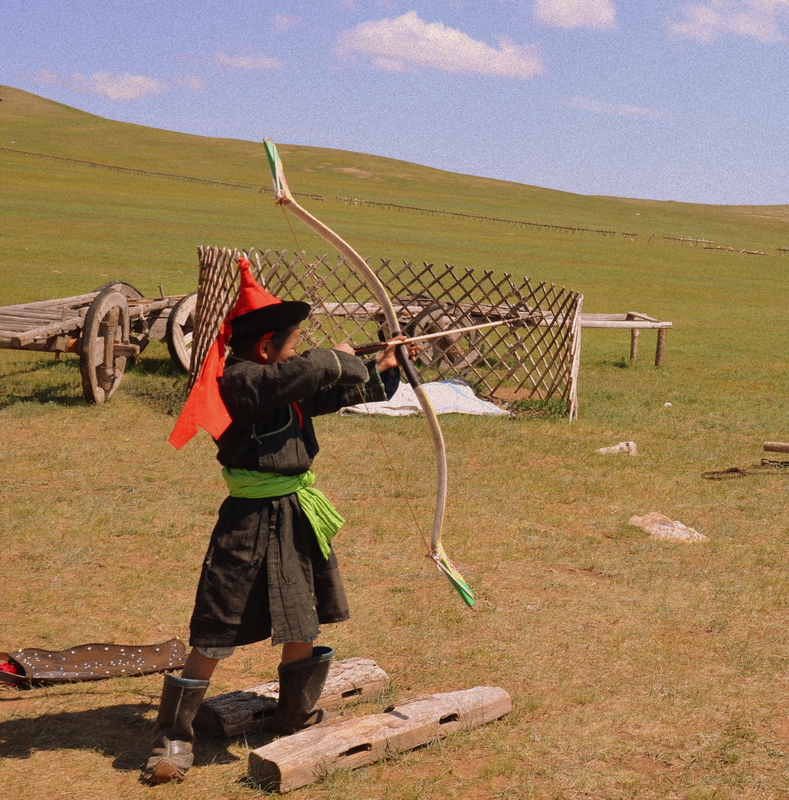 This goes on year after year for the only remaining true nomadic people left in the world — Mongolian nomads. 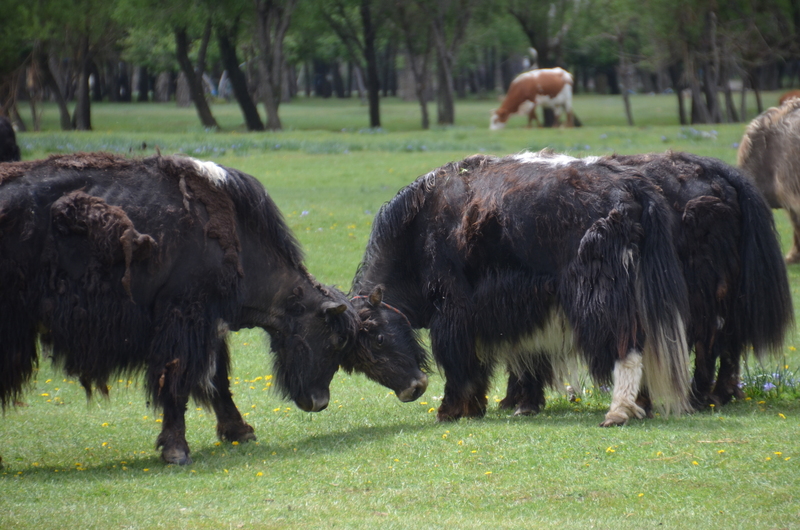 And the Yaks continue grazing at all locations.